NAAIP has teamed up with Salesdialers.com to bring you their industry-leading phone dialer/lead management software; a cloud based solution from this "A" rated BBB company. There are no contracts involved and there's no hardware to buy. Sign up using the coupon code "NAAIP" and get three months free usage. Call more leads, track their progress and make more sales using Salesdialers' award-winning technology, as used by some of America's top INC 500 companies. This product is considered to be one of the most affordable, advanced and comprehensive telemarketing solutions for agents. Make up to 400 calls per hour, with a productivity to wait-time ratio of 80:20. The system's cloud-based configuration means that you get to avoid the expensive costs of in-house automatic dialer systems and upload all your leads to their secure server, ready for you to start making sales at your convenience. All you need to do to receive this great offer is to sign up for a FREE insurance agent website from NAAIP by clicking here and completing the form. You will then be able to create your Salesdialers.com account via your personal website's back-office. The website features embedded life insurance and/or Medicare supplement quote engines, updated daily, plus the option to add pages, text and images. NAAIP pledge holders can host this site on their own domain with the URL of their choice. You can view an example of your free site here. How Does an Automatic Dialer Work? Depending on the type of office you have, the autodialing system will need to be configured accordingly. If you plan on using several operators to connect, then they will each need a dedicated phone, phone line and headset or a PC and headset if using a cloud-based system. If you are planning on fielding the calls yourself, it is easy to work on a single dedicated phone line and your office computer. Your choice of dialer system software is the most important part of your setup. Dialer software controls the numbers dialed and the response method for various situations, such as what to do when a person answers, an answering machine answers or a busy tone is heard, etc. The auto dialer software can differentiate between a machine and a human voice. So how does voice detection work? Should a call go unanswered for	more than four rings, there is a higher chance of a machine	answering the call. The dialer software calculates	whether a human is answering based on the timing of the speech when	a call is answered. If the initial words are followed by a pause,	the software knows that it is a human expecting a reply. The call will then be passed back	to you, the live operator or will play a recorded message according	to how you configure the dialer. There is a telling pause when a dialer system is in place, as	it takes a moment for the software to detect whether the party on	the other end of the line is human or machine before routing the	call. “What?” I hear you say...and true enough these are not acronyms that are part of the English lexicon outside the field of computer science. The fact is that VoIP and PSTN are important considerations when deciding upon your telemarketing set-up. They stand for Voice over IP and Public Switched Telephone Network. All you need to know is that PSTN is a standard, traditional land-line, as the name suggests. These are more common in in-house telemarketing set-ups, and are largely being fazed-out by VoIP. They are harder to configure as they can involve multiple phone-lines and voice modems. VoIP is the technology used in software applications such as Skype for making free PC to PC calls. Newer cloud-based telemarketing solutions utilize this technology to help agents streamline their telesales campaigns. Cloud-based telemarketing companies such as Salesdialers.com allow you to manage your entire telemarketing campaign online, cutting down on costs, whilst increasing your efficiency. 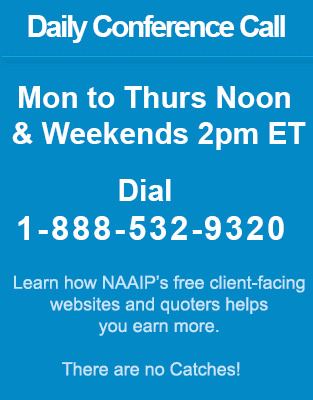 NAAIP have come together with Salesdialers.com to bring you a comprehensive insurance sales package. Once you have your potential client's interest, direct them to your free NAAIP website where they can view life insurance and/or Medicare supplemental quotes from your choice of insurance carriers and help them decide upon their ideal plan based on their personal requirements. No matter what size your business, from the single independent agent to larger corporations, NAAIP's free insurance agent website, coupled with Salesdialers.com's excellent telemarketing solution is ideal. Increase your sales efficiency and watch your business grow.